This page has information on the MFM hard disk reader and emulator I have been working on. The unit is intended to read MFM hard drives for archiving and to emulate one or two MFM hard drives to replace failing MFM drives. The image read from a real hard drive can be used for the emulation. In theory the unit can emulate any MFM hard drive. In practice there are enough variations in how controllers use the drives that software changes have been needed to make it work with some systems. You will need to use a command line to operate the unit for reading disks and to configure it for emulating disks. It should be able to read and save the raw transition data from most any hard drive using the ST506/ST412 interface. 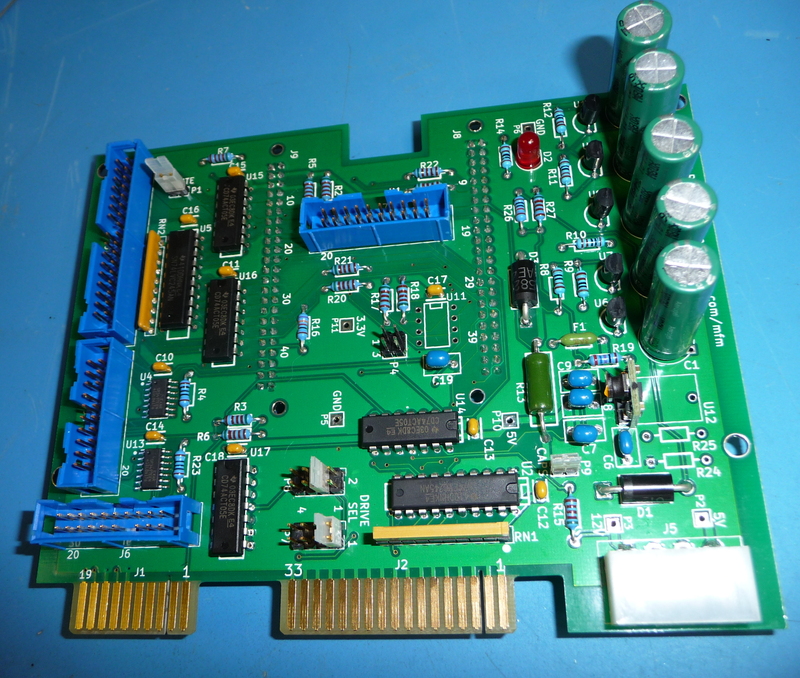 An adapter board is available to allow use with the SA1000 interface used on Shugart SA100# and Quantum Q20#0 drives. People are still running across formats it can't decode to sector data. For formats that are minor variations adding support doesn't take too long. For some controllers which did their own undocumented thing it can be significant effort to figure out the format. Handling physical to logical translation that some smart controllers did or any file system interpretation is outside the scope of this project. Writing to real disks is experimental supported. I disclaim any warranty of merchantability or fitness for a particular purpose. I have been providing support on a time available basis which sometimes means I can't look at your issue for a couple of weeks. I also may not be able to figure out/fix the problem. Some of the issues were only solvable because the person had a logic analyzer and schematics were available for the controller so we could understand what strange things it was doing. If you're still interested below are the prices. My so-so hand soldering surface mount chips $5 plus $3.00 a chip. Some people expressed desire to not have to solder surface mount chips. Assembled Board with BeagleBone Green (BBG) & PCB $175. Assembled Board without BBG $125. I can't provide the BBB/BBG outside the USA. The beaglebone green is a cost reduced version of the beaglebone black that should be fine for this usage. Shipping is $8 for USPS in USA and $14 to $23 to Europe for bare board. Assembled board is $15+$3 per additional board in USA and $42+ with insurance to Europe. SA1000 adapter bare board $20. It has one surface mount chip. For just that chip installed add $9. Shipping should be similar to MFM board. If you don't have a MFM board you will need one also. If this doesn't look like what you want there is another unit available from someone else. I have not used this unit. It is somewhat different than mine so verify it does what you want. When I looked at the pages it looked like it couldn't read an existing drive and the controller in your computer needed to be on the supported list for it to work. Email me at link at bottom of page if interested. If outside USA either send me information on shipping method you wish or your address so I can verify shipping cost. For bare boards you will need to order the parts from your distributor of choice. The assembled boards have all parts installed except U11 and associated parts. For this board where pin function changes based on mode the EEPROM doesn't seem useful. I have been mounting the capacitors on the bottom. You may request other. This page shows more on the mounting the capacitors. 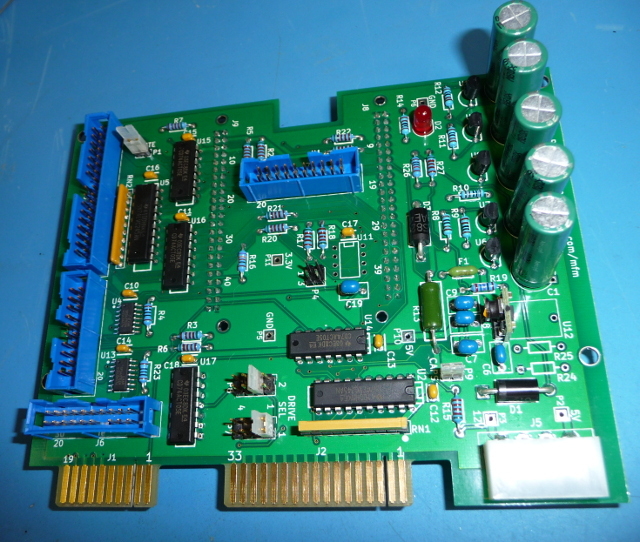 See this page if you are using the SA1000 drive adapter board. The current MFM boards being shipped are revision C. The following was changed: Several signal rearanged to the beaglebone which allows the time from select line active to output lines active to be reduced. This is makes the DTC 520 controller happy. Other changes were to add another pin to the cap jumper so you can move it to the new position when you wish to discharge the capacitors, reduce some track widths from the ground plane to pins to make getting a good solder joint on those pins easier, fixed slight misalignment of the mounting holes, and marked the pins you pull in the connectors better. If you are assembling the first revision of the board shipped in 2014 look at the above first then see the original assembly page. I am no longer updating that page. The current software works with all revisions of the board. These are what users wrote up on their use, not direct translation of my pages.